In a civilised and modern world images like that of the dog (right), pictured recently in Sicily, have no place. Animals Worldwide has been established to assist in the worldwide endeavour to bring such cruelty to animals to an end. It is clear from the reports of tourists returning to the UK from overseas destinations that there is a keen interest in animal welfare and related issues and that experiences can literally make or break a holiday. 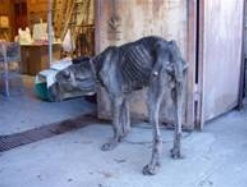 The presence of undernourished and ill treated dogs, cats and donkeys, for example, cause anger and distress while the pursuit of effective welfare campaigns gives real pleasure. Animals Worldwide is therefore building relationships with the tourist industry in order to harness the eyes and ears and energies of the holidaymaking and travelling public to identify both good and bad practice, to initiate action where necessary and to support those already working in the field, running small sanctuaries and organising neutering projects, for example. With the co-operation of the tourist industry Animals Worldwide would like, when appropriate, to offer welfare-friendly gradings for resorts and hotels. On the time-honoured principle that "one person can make a difference", Animals Worldwide believes that the co-ordinated dedication and enthusiasm of those already working for animal welfare worldwide and the vast travelling public, the "one people" who care, can be helped to mobilise as an enormous and effective resource. If you would like to make a donation to Animals Worldwide please click on the image below to be taken to our Just Giving page.